LINQTAPE PTFE5S-Series describes our 5-mil thick Skived PTFE Film with a silicone pressure sensitive adhesive. 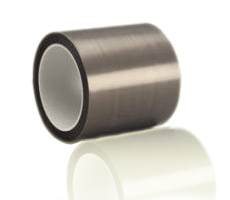 PTFE5S-Series tapes are used for high temperature applications. PTFE5S-Series Tapes have excellent acid resistance as well as alkali-resistance and have very low surface friction, making it ideal for heating panels. Further, PTFE5S-Series have been used successfully to wrap high voltage waire in high temperature operating conditions. Because of its Class H rating, it can be used in many electrical insulation applications. Sorry, there are no related videos for 5-mil Skived PTFE Tape Silicone Adhesive Single-Sided at this time. CAPLINQ is different. Unlike other business to business enterprises, we encourage our customers to discuss, critique, and otherwise comment on the products we offer. Get more technical information, read detailed posts, and see what customers have to say about about 5-mil Skived PTFE Tape Silicone Adhesive Single-Sided on our Corporate Blog and Forum. Read more about 5-mil Skived PTFE Tape Silicone Adhesive Single-Sided on our Blog. Join the discussion about 5-mil Skived PTFE Tape Silicone Adhesive Single-Sided on our Forum.